The SLFP yesterday made some dramatic changes in its Kurunegala District party hierarchical order. UPFA General Secretary Fisheries Minister Mahinda Amaraweera told, that he believed the move as replacing the inefficient and the hated with the efficient and popular, which was a segment of theParty revamping strategy. Kurunegala District MP and former Trade and Consumer Affairs Minister Johnston Fernando has been removed from the post of SLFP Organizer for the Nikaweratiya electorate. He has been replaced by Deputy Minister of Housing and Construction Indika Bandaranayake. In another move, Sports Minister Dayasiri Jayasekera has also been shifted from the Kurunegala electorate to Panduwasnuwara. "We have sacked not only Johnston from the organizer's post in Nikaweratiya, but alsoTikiri Adhikari from the organizer's post at Polhagawela and Ramanayake from Kurunegala,"Amaraweera said. He added that Tikiri Adhikari has been replaced by Jayaratne Herath in Polgahawela and Ramanayake has been replaced by Lakshman Wendaruwa in Kurunegala. Amaraweera said this was all in the bid to revamp the SLFP grassroots structure and to get rid of the inefficient and replace them with the efficient and popular. He also said the new appointments were made yesterday only for Johnston Fernando and Tikiri Adhikari as Ramanayake was sacked earlier. 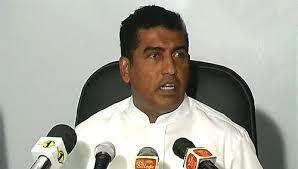 Sports Minister Dayasiri Jayasekera said these changes were mandatory in the interests of the future of the party. MP Johnston Fernando was not available for comment.